HEV, PHEV, BEV, FCEV… Do you, too, occasionally find yourself losing your way in this labyrinth of abbreviations? This article will help you find your way around! Electric vehicle (EV) is a sweeping term that, in its broadest sense, encompasses any car that uses electricity for propulsion. Electric vehicles can be broken down into battery electric vehicles (BEVs), hybrid electric vehicles (HEVs), and fuel cell electric vehicles (FCEVs). Battery electric vehicles (BEVs) rely solely on electric motors for propulsion. They derive their electricity primarily from charging points and store it in battery packs. This type of electric vehicle is exemplified by the forthcoming electric ŠKODA CITIGO. What makes hybrid electric vehicles different from BEVs is that their electric motor is still accompanied by an internal combustion engine. This type is exemplified by the forthcoming ŠKODA SUPERB PHEV. A fuel cell electric vehicle (FCEV), like a BEV, only has an electric motor, but it uses a different method to store and extract electricity. 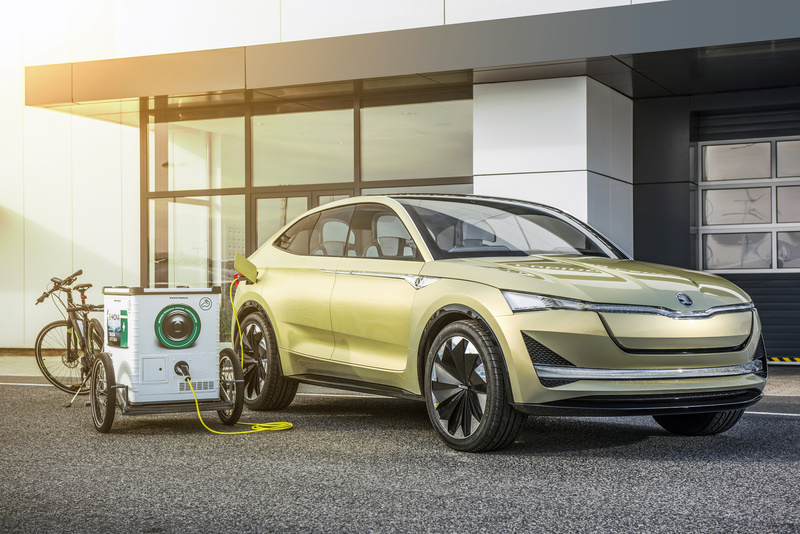 In FCEVs, much of the traction battery is replaced by a hydrogen tank and a set of fuel cells in which a chemical reaction transforms hydrogen into electricity and water vapour. This may sound like a highly promising solution, but when we take into account the design complexity and production costs, hydrogen remains a long way off. Hybrid electric vehicles (HEVs) can be broken down further into sub-forms. In principle, there are two ways of doing this. In the first method, they are classified according to the drivetrain set-up, as series, parallel and power-split hybrids. is always powered purely by the electric motor. The internal combustion engine is there only to recharge the batteries. This hybrid comes to the fore in urban traffic and, above all, in stop-and-go driving, where conventional cars’ internal combustion engines are less efficient. can be powered either by the internal combustion engine alone, by the electric motor alone, or by both combined. It is more efficient than a series hybrid at higher speeds, when it can draw on the potential offered by the two-motor combo if the need arises. can switch between the series and parallel modes to harness the advantages of each. This means that it can be powered by an electric motor only, by an internal combustion engine only, or by a combination of the two. 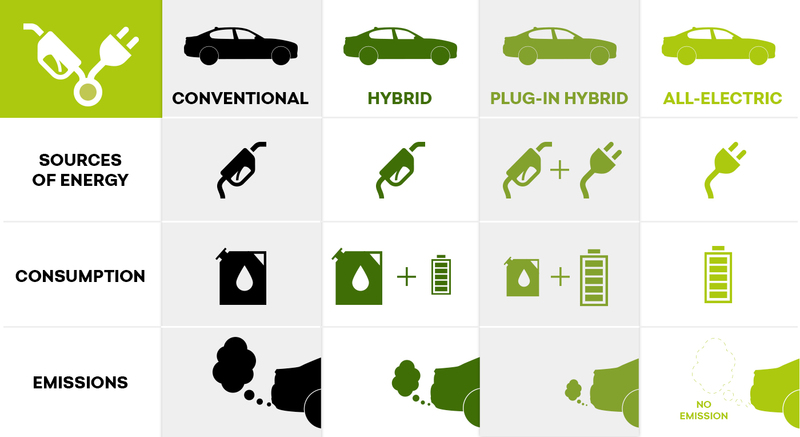 The second method classifies hybrid electric vehicles, according to their degree of hybridisation, as micro, mild, full and plug-in hybrids. is fitted with an electric motor, but still uses an internal combustion engine to power the wheels throughout each journey. The electric motor’s role in traffic is to assist the ICE, for example, when starting off or accelerating. It tends to be accompanied by an auxiliary battery with a larger electricity capacity to enhance the regenerative braking. This, in turn, boosts fuel efficiency further, thereby pushing down CO2 emissions. can be driven solely on electric propulsion, the only limiting factor being the battery capacity. 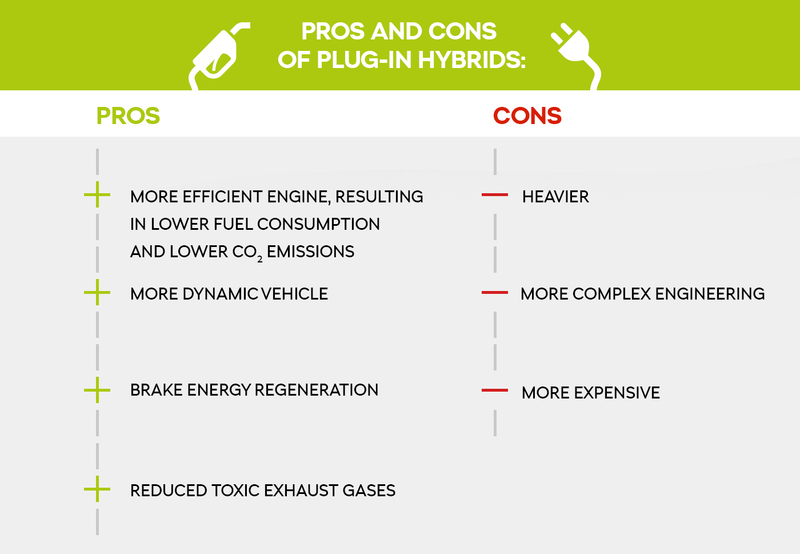 From a technical perspective, a plug-in hybrid is essentially a full hybrid with extra technology. The difference between a full hybrid and a plug-in hybrid (PHEV) is that the full hybrid’s electric-vehicle battery is charged solely via regenerative braking or the internal combustion engine, whereas the plug-in hybrid’s enlarged traction battery can also be charged from a power outlet or charging point. As a result, these days it can typically cover 50 km on electricity alone without having to ignite the internal combustion engine. This is becoming a particularly major advantage in city centres. One of the significant consequences of this system is that it generates the lowest CO2 emissions of any of the hybrid technologies explained above. In fact, the upcoming SUPERB PHEV, to be given its public première in 2019, belongs to this category.